Michael van Gerwen topped the Order of Merit after winning five of the eight ranked Speedy Services UK Open qualifiers, as fellow Premier League stars James Wade, Robert Thornton, Simon Whitlock and Raymond van Barneveld all booked their places at the Bolton tournament. van Gerwen won the final event of the 2013 series on Sunday, when the field of qualifiers for June’s finals were confirmed. As one of the top 32 in the final Order of Merit, ‘Mighty Mike’ gains automatic entry to the third round on Friday June 7 along with reigning champion Thornton, Whitlock, van Barneveld, Paul Nicholson and Mark Webster. Andy Jenkins qualified for the second round on Thursday June 6 as he collected £1,800 in prize money and returned to the top 64 in the world rankings. Joining ‘Rocky’ in round two are Co Stompe, John Henderson and Arron Monk, while Wade, Chris Aubrey, Vincent van der Voort and James Hubbard all also qualified for the tournament and will compete in the first round on the Thursday. Robert Thornton secured a brilliant McCoy’s Premier League double in Birmingham, where Simon Whitlock defeated Michael van Gerwen on Thursday evening. Thornton kept up the heat on the top four with victories against Andy Hamilton and Adrian Lewis at the NIA. “It was an important couple of wins for me,” admitted the Scotsman, who faces Phil Taylor next week in Liverpool. “I have slipped up a bit in the last couple of weeks but I’ve kept myself in it and I’m looking forward to the challenge of reaching the play-offs. Whitlock was denied a double when he lost out to Taylor after seeing off league leader van Gerwen earlier in the evening. Raymond van Barneveld came out on top in his match against James Wade, while Lewis lost to Taylor in the other match of the night. Michael van Gerwen can secure his place at the McCoy’s Premier League play-off finals with a positive result in Birmingham, where James Wade and Raymond van Barneveld will be looking to move closer to cementing their places inside the top four. Simon Whitlock and Robert Thornton are also in the race to compete in the tournament’s finale in May ahead of the twelfth night of action on Thursday. League leader van Gerwen is hoping to celebrate his 24th birthday by obtaining the point that would guarantee his place at London’s O2 in next month’s finals night but his opponent Simon Whitlock knows the importance of securing victory to keep his own bid alive. Whitlock , who hit a nine-dart finish in last year’s play-offs and finished as runner-up, faces a double-header against world number two van Gerwen and the highest ranked player, Phil Taylor. But ‘The Wizard’ insisted that he is not daunted by the challenge. 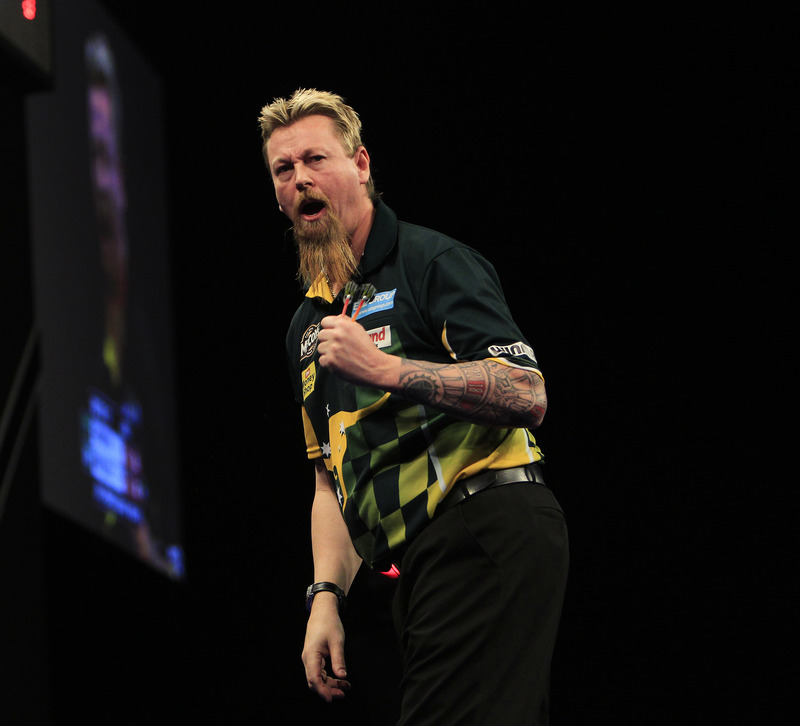 “I’ve got the top two players in the world rankings but I’ll be looking to do some damage,” warned Whitlock, who has claimed back-to-back victories since surviving relegation. Second and third place will go head to head in Birmingham as Wade and van Barneveld clash at the NIA. 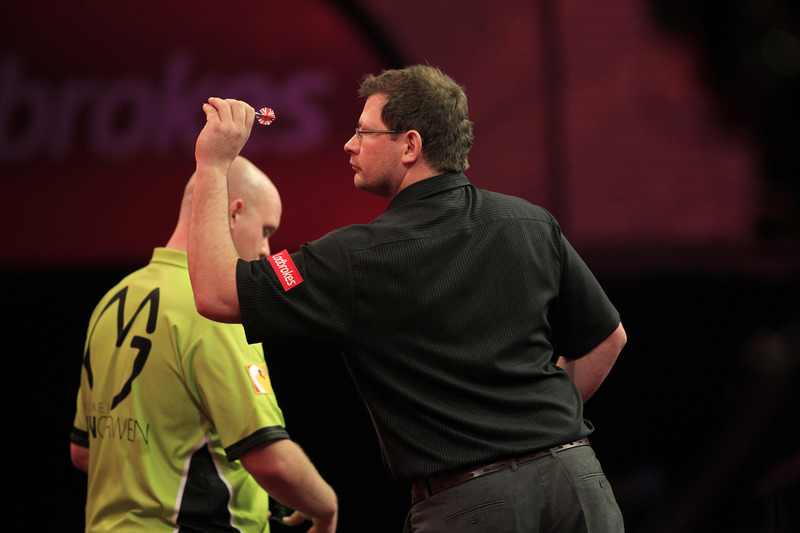 After the pair shared a draw in their previous meeting, Wade is confident of getting a result against the Dutch star. “We drew the last time we played and I was awful. I had gastroenteritis and hadn’t slept for two days and I still got a draw. Thornton takes on Stoke pair Andy Hamilton and Adrian Lewis and is looking to close the gap on the top four, or even climb back into it, after falling two points behind fourth-placed Taylor. “My focus is on the reaching the play-offs now,” said the Scottish ace. “That can only be achieved one game at a time though and it starts again with a tough match on Thursday. “A win against Andy started what has been an amazing first season in the McCoy’s Premier League for me and hopefully another one can kick-start my play-off push. Taylor and Lewis face each other in the evening’s other match. James Wade and Michael van Gerwen tightened their hold on McCoy’s Premier League play-off positions, while Simon Whitlock kept himself in the race on Thursday evening in Dublin. Wade secured a 7-4 victory against Robert Thornton to move onto 16 points in second place behind van Gerwen, who increased his lead at the top to four points with two wins at the O2. ‘Mighty Mike’, who also claimed four points in Sheffield last week, upped his debut season tally to 20 with triumphs over Raymond van Barneveld and Adrian Lewis. The Dutch star averaged over 106 in his 7-4 success against ‘Barney’, who shared a draw with Phil Taylor to boost his bid to stay in the top four. Whitlock earned an impressive 7-3 victory over Andy Hamilton, who had lost out to Taylor in the opening match of the night. 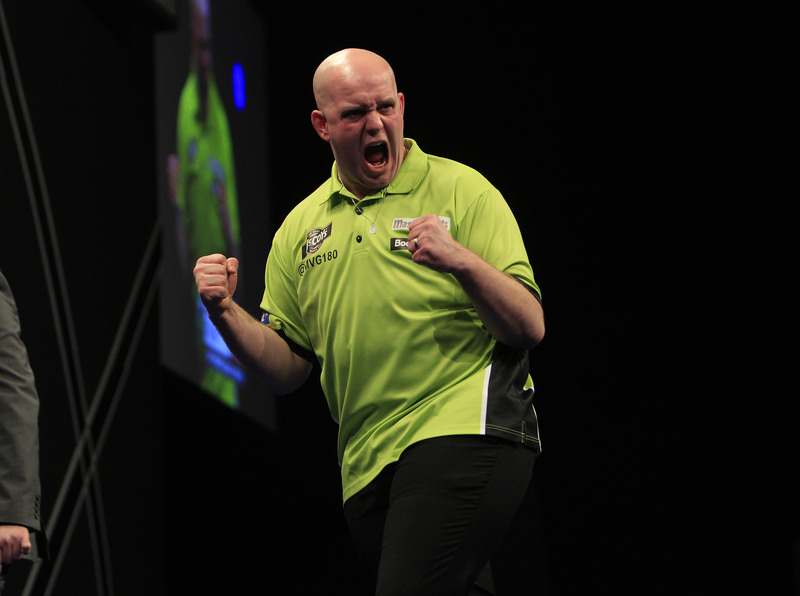 van Gerwen, whose exploits included finishes of 152 and 158, admitted his delight at his Dublin double. “This is the biggest crowd I’ve played in front of and it felt great,” said van Gerwen who also won a UK Open qualifier last Sunday. “My confidence is high and I’m very happy with how I’ve done in this Premier League. “I have great people behind me and I am enjoying everything at the moment. The race for May’s finals night continues in Birmingham next Thursday. Michael van Gerwen is hoping to extend his lead at the top of the McCoy’s Premier League with another double-header in Dublin, where James Wade, Robert Thornton, Raymond van Barneveld and Simon Whitlock will bid to boost their play-off chances. van Gerwen, who took four points from two matches in Sheffield last week, faces van Barneveld and Adrian Lewis on the eleventh night of action in what is proving to be a fabulous debut season for the young Dutchman. Victories over Wade and World Champion Phil Taylor pulled ‘Mighty Mike’ two points clear of the chasing pack at the top of the table and the reigning World Grand Prix champion has his eyes set on increasing that advantage in front of 10,000 fans at the O2 Arena. He told the PDC’s official website: “I’m top of the table now and I want to keep my place there. “I’m really happy with how I’m playing and I’m very confident at the moment. “Last week was a difficult night for me but I walked away with four points against Phil Taylor and James Wade, and it would be great to do it again in Dublin. “I like to play Raymond, and I think it’s a game that everyone else likes to see at the moment too because we’ve had some great matches in the Grand Slam final and at the Premier League earlier this year. Second-placed Wade goes head to head with Thornton, who is currently occupying the final play-off spot. van Barneveld faces the tough task of taking on van Gerwen and Taylor in the same evening, while Whitlock is hoping victory against Andy Hamilton can put him firmly in the race for May’s finals night. “It’s another huge game against somebody above me in the table,” said the Australian, who won a UK Open qualifying tournament at the weekend. “Andy is a tremendous player and really tough to beat because he is so gritty. “I’ve got eight points at the moment and am probably going to need at least 15 or 16 to make the top four. Simon Whitlock and Michael van Gerwen both picked up Pro Tour victories in Wigan at the weekend. Whitlock won Saturday’s UK Open Qualifier Five with an excellent final victory over van Gerwen, who went on to win Sunday’s event – his fourth success out of the six floor events played so far this year. ‘The Wizard’ produced some magic on Saturday to win through a tough field of players competing to gain entry for June’s UK Open. He fought back from 5-1 down to defeat Ian White 6-5 in the quarter-finals before seeing off Peter Wright to reach the final, where he claimed an impressive 6-1 win against world number two van Gerwen. “This is one of the best wins I’ve ever had. 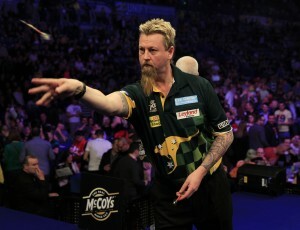 I’m absolutely thrilled to bits,” Whitlock told the PDC’s official website. “I had a bit of luck earlier on but I played really well in the final and I’m over the moon. van Gerwen, whose run to Saturday’s final included a second victory in three days against World Champion Phil Taylor, clinched Sunday’s £6,000 first prize by edging past Kim Huybrechts in the final. His best performance en route to glory was a 6-1 semi-final success over Michael Smith, with the Dutchman averaging over 112. 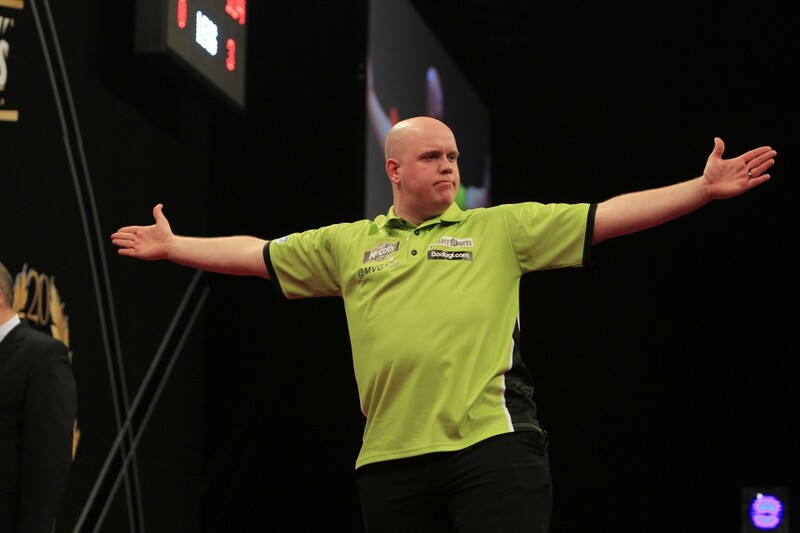 “I’m very proud of myself but I can still do better than this,” van Gerwen told the PDC’s official website. “It feels so good to get another win. I’m very confident at the moment and that has a lot to do with it because I’m even winning bad games and I’m doing very well. Whitlock and van Gerwen will now turn their attentions back to the McCoy’s Premier League, which continues in Dublin on Thursday evening. Michael van Gerwen moved clear at the top of the McCoy’s Premier League as James Wade, Simon Whitlock and Raymond van Barneveld all also grabbed important victories in Sheffield on Thursday evening. van Gerwen claimed a brilliant triumph against world number one Phil Taylor before going on to edge out Wade, who had earlier seen off Adrian Lewis with an equally delightful display at the Motorpoint Arena. van Gerwen, who also faces a double-header in Dublin next Thursday, was delighted with his evening’s exploits. “To beat Phil Taylor in the Premier League was a huge moment for me,” said the world number two. “I had targeted at least two points tonight so to go on and take on all four makes me very happy. “I felt that I was much the better player against Phil and then I had to win a game that wasn’t as good against James. The tenth night of action began with Whitlock, who survived a relegation scare last week, getting back to winning ways against Robert Thornton. Wade then swept past Lewis with a 7-2 success, in which ‘The Machine’ averaged around 104 and hit five 180s before van Gerwen took to the stage against Taylor in a repeat of January’s World Championship final. ‘The Power’ prevailed on that occasion but ‘Mighty Mike’ stormed to victory in Yorkshire, also averaging 104 in a comfortable 7-3 triumph. van Barneveld then earned a hard fought win against Andy Hamilton to leave himself tied on 14 points with Wade and van Gerwen at the top of the table. It was van Gerwen who was to take a clear lead as he increased his tally to 16 with a 7-5 victory over the 2009 champion. Next Thursday sees the tournament reach Dublin, where ‘Barney’ will take on Taylor and van Gerwen, who will also face Lewis. 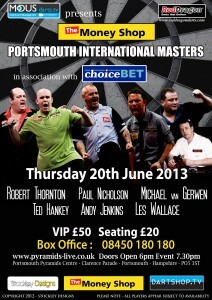 Wade and Thornton will do battle at the O2, where Whitlock will play Hamilton. James Wade and Michael van Gerwen are both preparing for a double header in Sheffield, which sees the pair play their tenth and eleventh fixtures of the McCoy’s Premier League Darts season. 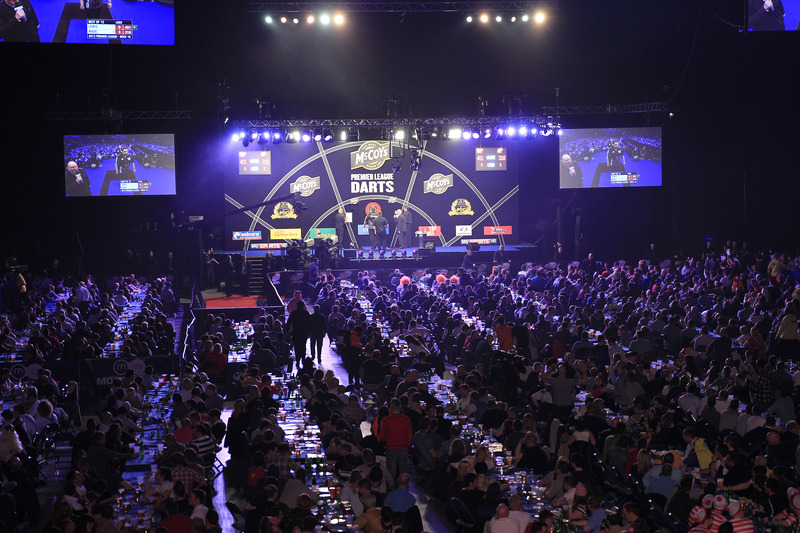 The top of the table duo are set to face each other in final fixture of the night in South Yorkshire, where Wade will also face Adrian Lewis and van Gerwen takes on Phil Taylor. They are the first of the players who will have to play two fixtures in one evening following the elimination of Wes Newton and Gary Anderson in Brighton last Thursday. ‘Mighty Mike’, who lost out to Wade just a fortnight ago in Glasgow is looking forward to the challenge. “I’d like to play five games every evening,” said van Gerwen, who is joint top of the league with Wade and Raymond van Barneveld. “That’s not going to happen I know but I will enjoy playing two. Second-placed Wade also goes into the evening in fine form after defeating Anderson last week and hitting seven doubles out of eight attempts in the process. “My finishing is going well,” said Wade, the 2009 champion. “But my scoring is getting there as well now and I’m feeling great. van Barneveld, who secured a fine win over Lewis last Thursday, faces Andy Hamilton in Sheffield, while Robert Thornton, who currently occupies the other play-off slot takes on Judgement Night survivor Simon Whitlock. See some of the stars of Premier League Darts in action at the Portsmouth International Masters – Tickets available from www.dartshop.tv or call 08450 180 180 now. Robert Thornton stunned Phil Taylor with a brilliant performance in Brighton, while James Wade and Michael van Gerwen moved joint top of the McCoy’s Premier League on Thursday evening. Thornton moved into the play-off places at the expense of world number one Taylor as the Scotsman continued to impress on his debut season. The reigning UK Open champion averaged well over 100 for the second week running as he claimed an impressive 7-4 success over ‘The Power’. The victory moved ‘The Thorn’ onto eleven points and third in the table, as attention turns to the race for the play-offs after Wes Newton and Gary Anderson suffered relegation. “I’m very proud of myself,” admitted Thornton, who has now won three of his last four televised matches against Taylor. “Not just for tonight but for how I’ve taken to the Premier League so far. Wade defeated Anderson in convincing fashion, with ‘The Machine’ hitting seven out of eight attempts at doubles en route to a 7-3 triumph. “It is going really well this year,” said Wade, the 2009 winner. “It wasn’t nice to knock Gary out of the tournament but I had a job to do and I did it. “It puts me in a good position to reach the play-offs. van Gerwen joined Wade at the summit of the table with victory over Simon Whitlock, who survived relegation despite the defeat. Raymond van Barneveld claimed a comfortable victory over Adrian Lewis to join van Gerwen and Wade on twelve points, while Andy Hamilton defeated Newton in the other match of the evening. 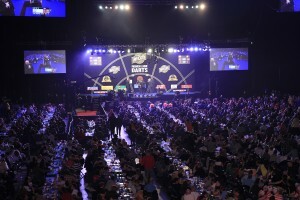 Visit www.dartshop.tv for tickets to exclusive professional darts events featuring some of the stars of the Premier League. Simon Whitlock faces a ‘Judgement Night’ showdown in Brighton as he and three other players battle to avoid being the first ever casualties of the new relegation format of the McCoy’s Premier League, which will see two players eliminated on Thursday night. Whitlock, who has six points from the first eight weeks of action, faces Michael van Gerwen at the Brighton centre in the knowledge that victory will ensure his safety from the dreaded drop. However, van Gerwen will prove a tough opponent as one of the players in a four way tie at the top of the table in the tightest ever staging of the tournament in it’s nine year history. “I know it will be tough,” admitted Australian ace Whitlock. “But every game has been tough for all of us. That is why it is so close. “Whoever stays up will then have a great chance of going on to reach the play-offs. Whitlock may avoid relegation before he faces ‘Mighty Mike’ if other results go his way. 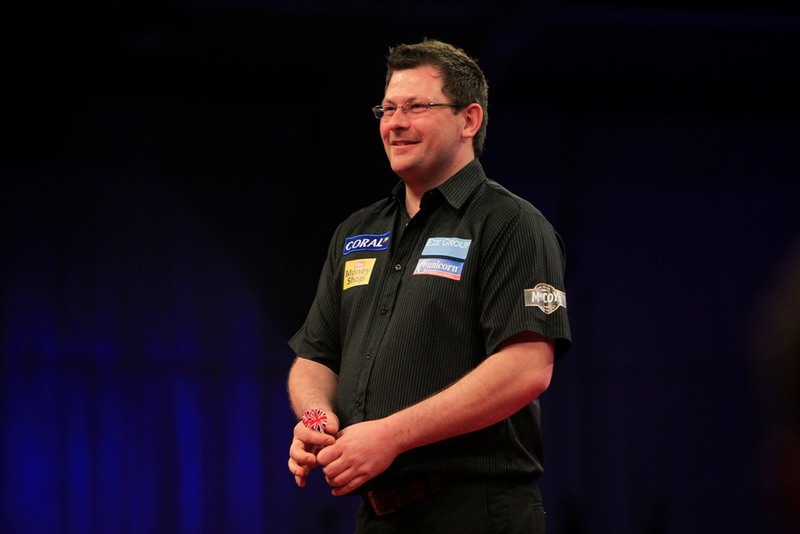 James Wade takes on Gary Anderson and victory for ‘The Machine’ paired with defeat for Wes Newton against Andy Hamilton would see ‘The Wizard’ reach safety. Wade, who is also on ten points after seeing off van Gerwen in Glasgow last week, is hoping continue his good form against 2011 winner Anderson, who is currently in the relegation zone. “I want to keep playing well and winning games to reach the play-offs,” said 2009 champion Wade. “It won’t be a nice thing to beat someone and relegate them but while it may be new in the Premier League it’s nothing new in darts. Raymond van Barneveld, another of the joint leaders, takes on Adrian Lewis and a victory for the Dutch legend would leave ‘Jackpot’ in danger of elimination and awaiting other results. Robert Thornton takes on Phil Taylor in the only match that won’t affect the relegation battle. The Scotsman reached safety with victory over Whitlock last week and is in a relaxed mood ahead of his tie against the world number one. “Bring on Mr Taylor,” said Thornton, who defeated the 16-time World Champion twice on TV last year – including in the final of the UK Open. “I know I can beat him and he knows he can beat me so it is all about how we perform on the night.